Renowned for its ability to rejuvenate, soften and smooth skin. Dilute with a carrier oil and add to your regular skincare routine. Can also help support a healthy digestive system. Add a few drops to Evening Primrose Carrier Oil and massage onto your abdomen in a clockwise manner. Diffuse to relieve worry and promote relaxation. No! Carrot Seed is NOT KidSafe. Dilute in your favorite carrier oil at 1% for facial applications or 3% for body application. Add a few drops to your diffuser or personal inhaler to promote relaxation and support a healthy respiratory system. Cypress, Frankincense Frereana, Geranium Egyptian, Lavender, Lemon, Marjoram Sweet, Patchouli, Rose Absolute and Spearmint. Check out all our other essential oil spotlight blog posts by heading to our Spotlight Page! So why use carrot seed? Whether you bake them, mash them, or enjoy them raw, carrots are arguably one of the most popular root vegetables! Introduced to Europe and Asia about 600 years ago , these nutritious veggies continue to be a staple in diets around the world. 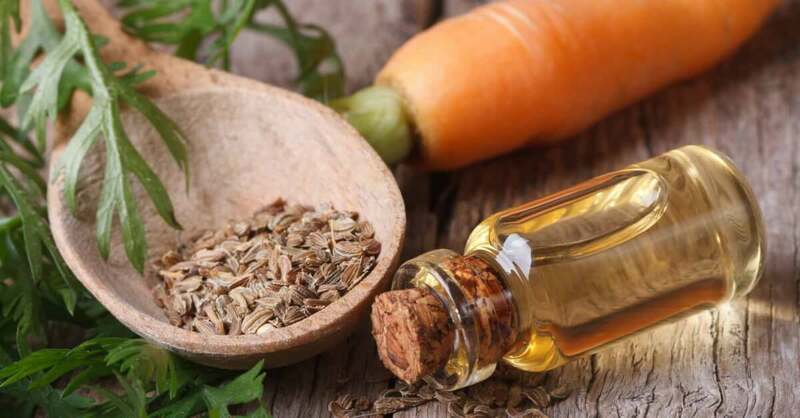 The seeds of wild carrots (Daucus carota) are dried, crushed, and steam distilled to produce an essential oil that is packed with therapeutic benefits. However, it is important to note that these benefits are not the same that comes from the root of the carrot. This root, the part of the plant we associate with carrots, can be cold-pressed and made into a carrier oil chock-full of vitamins A and E . On the other hand, Carrot Seed Essential Oil lacks these vitamins but is rich in certain bioflavonoids, such as the carotene sesquiterpenes carotol, which is known to be a powerful antioxidant . Let’s take a look at some of the amazing benefits this nourishing essential oil can offer! This is where Carrot Seed really shines—skin care. 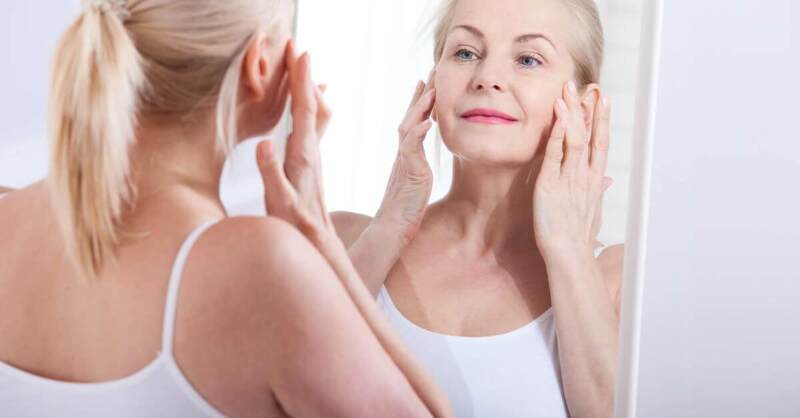 It is known to contract and tone muscle tissue, add elasticity, diminish the appearance of age spots and fine lines, and balance the skin’s sebum . Carrot Seed makes an excellent addition to any blend designed to combat symptoms of eczema and psoriasis since it is wonderfully nourishing to even the dryest areas of skin. Use it to rejuvenate the look of dull skin, help improve elasticity, and deeply moisturize. We recommend a dilution of 1% on the face and up to 3% for other areas of the body. Enjoy this Youth Face Serum to help smooth and soften your skin. 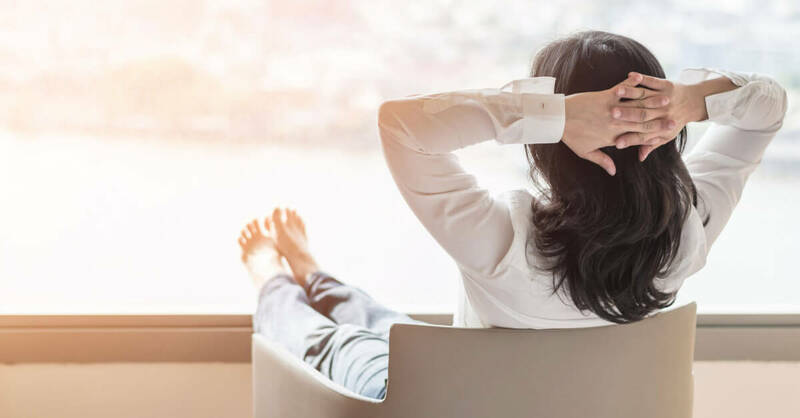 Or, to help speed up the healing process of a nasty sunburn, use 1 drop of Carrot Seed alongside 5 drops of Lavender in a couple of teaspoons of Aloe Vera Jelly or carrier oil. 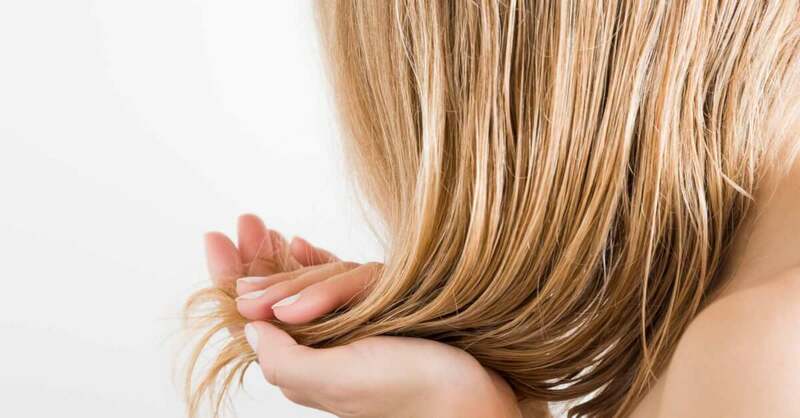 Enjoy strong and nourished hair. 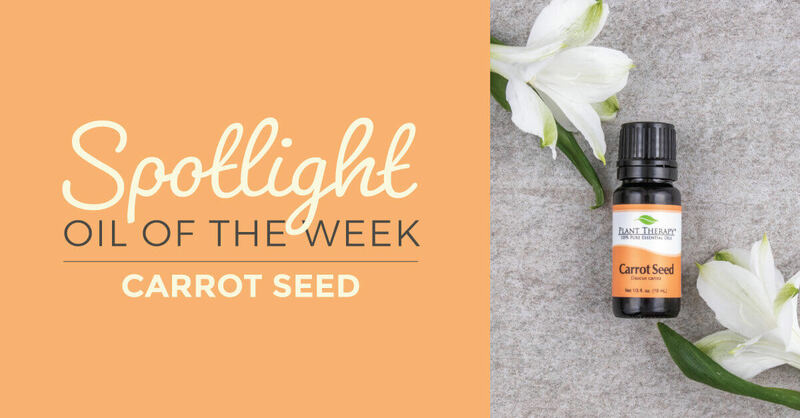 Carrot Seed’s moisturizing properties aren’t just marvelous for your skin—your hair gets some great benefits, too! 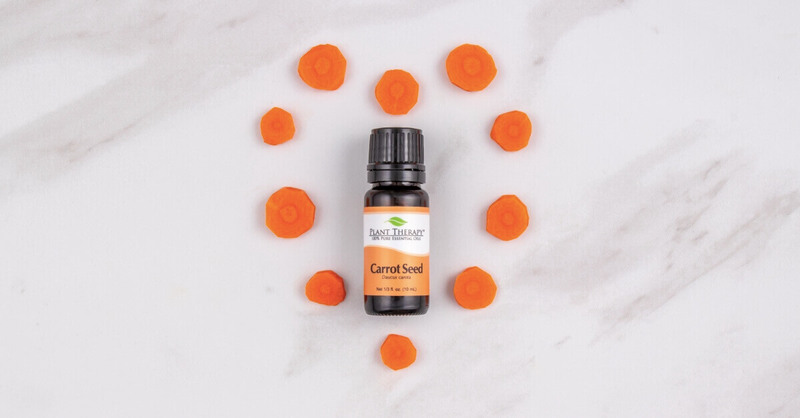 Add a drop to your current hair moisturizing products or create a nourishing hair serum with Carrot Seed and your favorite carrier oil. The high amount of antioxidants found in this EO are thought to help protect hair from environmental damage so it stays healthy and silky soft. Put your pain on pause! Sore muscles and joints happen to all of us. Maybe you overdid it at the gym. Or maybe you’re suffering from the normal wear-and-tear of living life. Either way, adding Carrot Seed to your arsenal of wellness products can help with the discomfort. 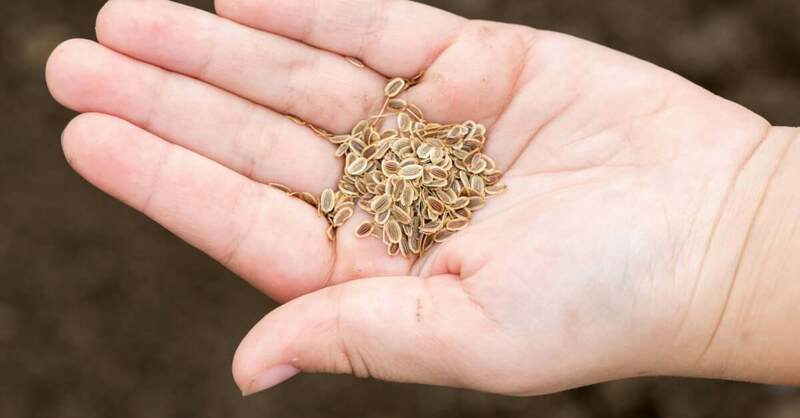 Particularly useful in addressing some of the uncomfortable symptoms of arthritis and rheumatism [1,4], simply dilute Carrot Seed up to 3% in a carrier oil or lotion and massage onto the areas of concern. Traditionally, Carrot Seed was a popular choice for combating uncomfortable digestive issues. It possesses carminative properties, which assist a tummy distressed from cramps and gas. By acting as a tonic for the digestive system and soothing the intestines, gas can be expelled easier. This helps reduce discomfort in that area so you can go on about your day without stomach troubles on your mind. We recommend that Carrot Seed Oil be diluted in a carrier oil and gently applied to the abdomen in a clockwise manner. Try blending with Sweet Fennel and Pink Grapefruit for more digestion aid! Carrot Seed has some amazing benefits for our bodies, that’s for sure. But its unique, persistent aroma is often at the forefront of everyone’s mind before they make the purchase. So what exactly does Carrot Seed EO smell like? It’s a bit spicy, very earthy, and has a strong herbaceous musky-type scent with a slight touch of sweetness. While it may not popularly stand on its own from an aromatic perspective, it blends well with a wide range of other essential oils. Just keep in mind that you only need a very small amount to make an impact. Try mixing Carrot Seed with Rose Absolute, Patchouli, Frankincense Frereana, Cypress, or Lemon. When using topically, you may enjoy Tamanu Carrier Oil as the base. Its rich nutty scent helps to mask the essential oil’s aroma if you find that it is not to your liking. Purchon, N., & Cantele, L. (2014). The Complete Book of Essential Oils and Aromatherapy, 25th Anniversary Edition. (Novato, CA: New World Library. Pg. 43. Keller, E. (1999). Aromatherapy Handbook for Beauty, Hair, and Skin Care. Inner Traditions/Bear & Co. Pg. 26. Worwood, V. (2016). The Complete Book of Essential Oils and Aromatherapy, 25th Anniversary Edition. Novato, CA: New World Library. Pgs. 575-576. I have this. I only use a drop in my serum. Mixed with other oils and I like the smell. I bought this b4 it was a spotlight oil of the week coz I read the benefits of it as a facial serum. The smell was really too much to stomach. I’ve made a few blends and find mixing it with skin restore does tone the smell down. Hoping to see good results soon. I am planning on trying this in my hair!!!! Sounds great! I have added this to a facial cream and also to a scar synergy for the softening. Love it I do not mind the ‘earthy’ scent. Have been using carrot seed oil in may facial serum blends with nice results. Now that I know, will be adding some to my digestive blend as well. And tho the smell isn’t great, is not that awful to me. Thanks for posting this! I have been using this a week with frankincense and myrrh and my face is brighter and feels so soft. I hope my dark spot will be better too. the smell is not the good side but I am fine as long it works for my face! As most have said. I am not a fan of the smell but my gosh does my face love it!! I use it in a nightly cream, I add it to my shampoo and ny next DIY is a pain ointment with it in it. Wonderful information. Can’t wait to try Carrot Seed EO. I’m not a big fan of the scent of carrot seed oil, but I have used it in a facial blend and it’s amazing! I didn’t know that it could also be used for digestion; that’s what I’ll try it for next! Thanks, as always, for some more great information! Looking forward to tying this in a anti aging face blend. Meant to get myrrh a few weeks back but missed the weekly discount so that will go on my wish list. Buying this now so I don’t miss out. This is great information! Thanks Plant Therapy! I like the scent of this oil on it’s own, but since my husband does not, I blend with black pepper and neroli to create a pleasing scent with a bigger punch for relief of digestive issues. 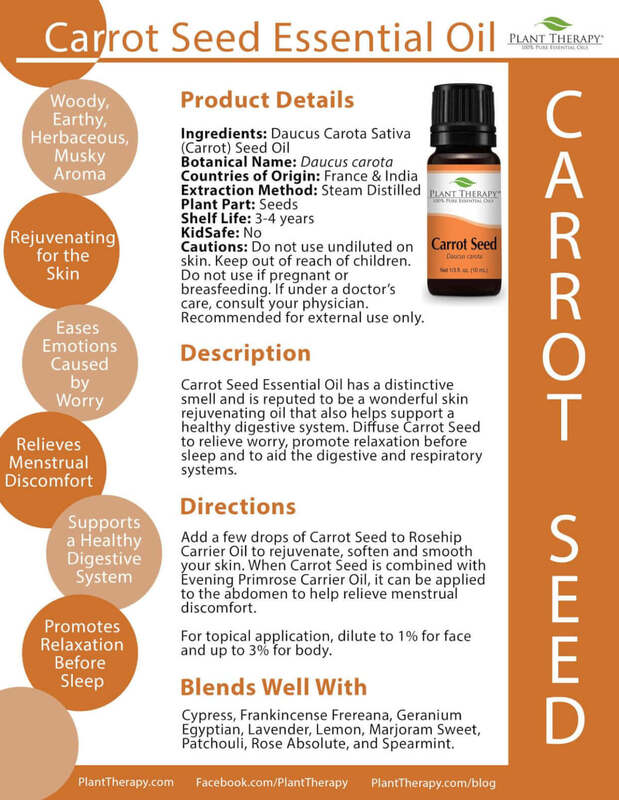 Thanks for the great info on Carrot Seed essential oil! I have some, I bought a 10ml bottle….but was afraid I wasn’t going to be able to use it all before it expired as the smell is pretty, well, interesting, and strong! I’ve used it in a facial serum and really love the results. Thanks for more ideas. Thanks for this. I ordered carrot seed awhile back to use on my face then I won a bottle on a live a couple of weeks later! I need to use some up. I’ll be trying some of these recipes. Great information. After reading all the benefits I would be using it more often. I had no idea there were so many benifits of carrot seed oil! I may need this after all. Plan to give this a try. I was surprised to see there was a “carrot seed” oil! Never would have thought of that. I can imagine that it has some powerful benefits, since the vegetable itself is amazing. Will put this on my list to try for my hair and face. Thank you for the tips! Carrot Seed has worked really well in my homemade face serum! I had no idea that it could help eczema, so I’m going to try it for that next. Thank you! I use this carrot seed oil in my face serum, it does have a strong smell, but mixed with the other oils not to bad! I know it is good for the skin! Thank you PT for offering it! Looking forward to getting mine and using it in an anti aging syrum. I didn’t realize it would be good for my hair too. So excited to try it! Thank you! I bought some a while ago and only knew about the face uses. These other ideas are great! Though it is unique, I don’t find the scent unpleasant. I’ve been using my carrot seed oil as an anti-aging facial oil but now am eager to try it also for the aforementioned digestive relief and joint pain relief. Go carrots!!!! I really do love my carrot seed. It smells a little funky alone but in a serum with frankincense frereana, and geranium it really didn’t smell off putting. The benefits outweigh the smell for sure! Now I’ll use it more!!!! Looking forward to trying this with all it’s benefits. Also, today is my birthday, 4-12-2960, so looking forward to applying points toward another purchase. Love Plant Therapy! I’ve mostly only heard about the smell! Thank you plant therapy for giving me lots of good reasons to consider purchasing this oil that outweigh the difficulty of overcoming the smell. Thank you for the great information. Looking forward to purchasing this for face and hair care. I love this in an anti-aging serum at night. Do you find it stains as some say it does? All good information. I was wondering what the difference between the carrot seed EO and the carrot carrier oil was. Good to know the difference. I LOVE carrot seed oil for blending in my DYI anti-wrinkle face serum. One of the top ingredients I use. However, I only buy organic oils so unfortunately, I don’t get this specific oil at PT. Wish they made all their oils in organic. Carrot seed is outstanding for aging skin, either as an EO or carrier oil. I have had my eye on this one for a long time, and I think you just talked me into it. Everyone talks about the ‘distinctive’ smell so much, kinda can’t wait to see how bad it actually is. Glad to see it is an oil with a longer shelf life (3-4 years). I’ve had this oil for at least a year and have not used it! Lol I used expensive facial products and I’m scared this won’t mix well. But I will try it snd def for my hair! I already love carrot seed oil for my face, I’ll have to give it a try in my hair too! Excited to try ALL the oils! I purchased this recently to make a face serum for mature skin. Glad to hear it can help with other skin problems and pain relief! Thanks for the article! I’ve been on the fence about this oil, but I’m going to try it! Why isn’t this EO safe for children? And is it safe/effective for use during pregnancy to help prevent stretch marks? I’ve just been looking at skin care blends all of which contain carrot seed oil. Perfect timing! Going to make sunscreen for my family and the recipe called for Carrot Seed oil. Excited to try it!